The new 2017 Kia Sedona is a serious contender in the cutthroat minivan market against the all-new Chrysler Pacifica as well as established family favorites like the Honda Odyssey and Toyota Sienna. With available seating for seven or as many as eight passengers, the new Sedona brings strong value, modern style and an aggressive list of features to the class. Best vehicle purchase we could have made! I have literally had no problems with my Kia Sedona. I love it! My husband was completely against buying a "minivan" in the beginning but this one has won him over! It is 100% reliable and so comfortable! We have two little boys 1 and 2 years of age and they love it. I use to drive a smaller car and they were cramped and sat so low they couldn't see out the windows. Now, they have plenty of room and enjoy watching out the windows telling me what they see as we go. There is plenty of room in the back row as well. It is awesome to be able to pull down one side of the back seat so I can change a diaper on the go without having to rearrange everything in the whole vehicle! We took a road trip to the beach this summer, about a 10-12 hour drive one way. We took my sister, her husband, their 3 year old son, our two boys, my husband and myself and we were all very comfortable! No complaints! I cannot say enough about how wonderful this van is! We absolutely love it! 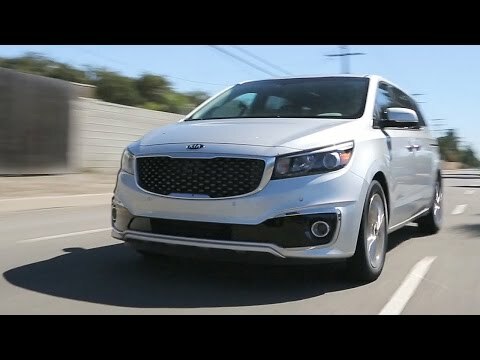 The Kia Sedona is a great SAFE family vehicle with the biggest bang for your buck, i compared them all and have been so glad we went with it! I haven't had any problems with our Kia Sedona at all. We all absolutely love it and all the features that come even on the base model! It gets great gas mileage, I average 22 mpg and i live in a rural area. My children all love that the seats ALL recline and that they have their own vents and can control the back from the middle row. The 3rd row seats fold flat and up so easily I can do it one handed while holding the baby. My husband even likes driving it and he had no desire for a minivan! It is so roomy that we can sit comfortably in the driver's seat with the infant seat directly behind and plenty space in that row and 3rd row still! We have back up camera, satellite radio, auto fold mirrors and many other features. I enjoy driving it. My Kia Sedona provides a quiet and smooth ride! My 2017 Kia Sedona serves my needs. I have not experienced any problems to date. It features seven seats, which are quite comfortable. The individual seats as well as the back seat can recline. The sliding side doors are easy to open and close and make it easy to enter and exit. My Kia Sedona provides me the opportunity to talk hands-free as it has the phone sync feature. The radio and phone controls are both on the dash as well as on the wheel right at my fingertips. Further, it has a radio and CD player as well as charging capability. It features front and back ac controls. It rides well. It is very comfortable. Storage space is adequate. While it does have a backup camera, I wish it had an alarm to indicate when to stop backing up.